The surface characterizations of engineering materials effects their scratch/abrasion/Mar resistance, coating adhesion/strength, and abrasive wear mechanism. 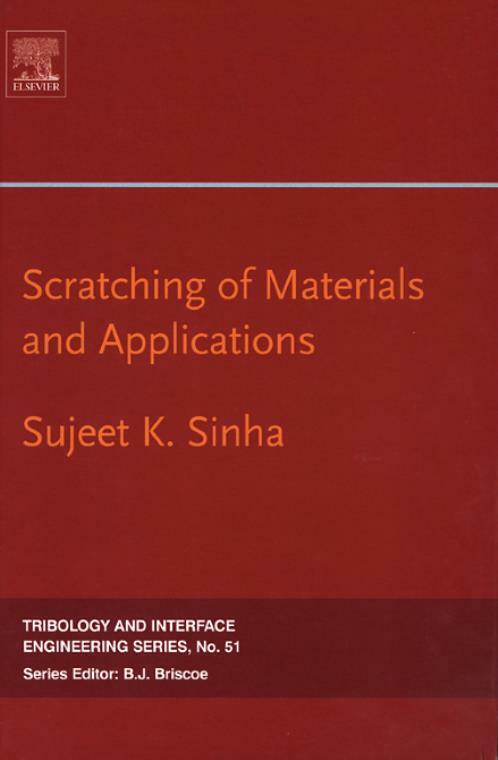 Scratching of Materials and Applications has chapters devoted to direct industrial application and contains some of the important works that are being conducted. Scratch testing of materials has grown extensively since the earlier days of the Mohs Scale for ranking minerals according to their relative scratch resistance. This test has been used on metals, ceramics, glasses, polymers and coatings of various types and thicknesses. The chapters are grouped according to the type of the engineering materials used. The beginning chapters relate mostly to bulk polymers, which are followed by different types of coatings (hard wear resistant to the diamond-like carbon coatings) and finally, chapters on the application of scratching technique to metals and ceramics are included at the end of the book. Thus, the book covers a fairly wide spectrum of engineering materials which are useful to engineers and researchers. Chapter 1. Mechanical Analysis of the Scratching Properties of Coated Polymers (C. Gauthier et al.). Chapter 2. Mechanical Analysis of the Scratching of Metals and Polymers at Moderate and Large Strains (E. Felder, J.L. Bucaille). Chapter 3. Friction, Damage and Stick-Slip in the Scratching of Polymers (S.L. Zhang). Chapter 4. Nanoscratch and Interfacial Friction of Poly(Amide) Fibres (J. Cayer-Barrioz et al.). Scratch Resistance of Polymeric Coatings Throughoptical Scattering (Li-Piin Sung et al.). Chapter 6. Scratching of Polymers: Deformation Mapping and Wear Modeling (S.K. Sinha). Chapter 7. An Overview of the Potential of Quantitative Coating Adhesion Measurement by Scratch Testing	(S.J. Bull, E.G-Berasetegui). Chapter 8. Characterization of Mar/Scratch Resistance of Coatings with a Nano-Indenter and a Scanning Probe Microscope (Weidian Shen et al.). Chapter 9. Evaluating the Cohesive Strength of a Surface Material by Controlled Scratching (Yongsong Xie, H.M. Hawthorne). Chapter 10. Mechanical Characterization of Nanostructured TiB2 Coatings using Microscratch Techniques (N. Panich, Y. Sun). Chapter 11. Damage Identification of Dlc Coating by Microscratch Test (A. Djamai et al.). Chapter 12. Correlation between Adhesion and Wear Behaviour of Commercial Carbon Based Coating (K.H. Lau, K.Y. Li). Chapter 13. The Study of the Adhesion of a TiN Coating on Steel and Titanium Alloy Substrates Using a Multi-Mode Scratch Tester (J. Stallard et al.). Chapter 14. Studies on Friction and Transfer Layer using Inclined Scratch (P.L. Menezes). Chapter 15. Scratch Resistance of High Nitrogen Austenitic Stainless Steels (A.P. Tschiptschin et al.). Chapter 16. Abrasion of Engineering Ceramics, AlMgB14-tiB2 Composite and other Hard Materials (S. Bahadur, A. Ahmed).